Seal of the United States Department of Justice. The origins of the seal are unknown; it was first used in the 19th century as the seal for the Office of the Attorney General (prior to the formation of the Department of Justice) but the exact date is unknown. Even the translation of the Latin motto is murky, a matter of debate between Latin scholars. The Department's currently accepted translation is who prosecutes on behalf of Lady Justice, referring to the Attorney General. The motto is an allusion to the wording of the writ in a qui tam action: qui tam pro domino rege quam pro se ipso sequitur ("he who sues on behalf of our lord the King as well as for himself." The current-day seal dates from 1934, when some (though not all) of the heraldic mistakes on the original were corrected. More information here. Source Extracted from PDF file available here. Public domain from a copyright standpoint, though other restrictions apply. 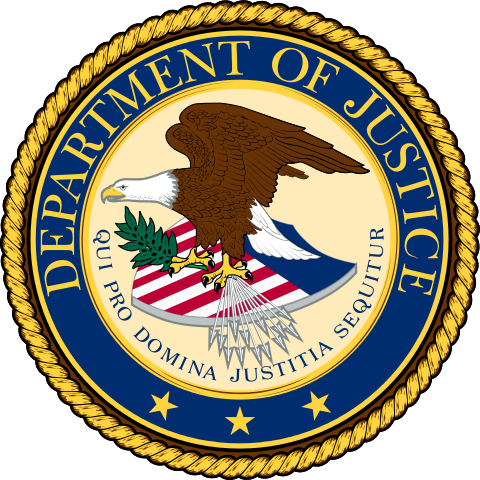 Department of Justice seals, logos and other official insignia may not be used or reproduced without written permission. (see here).